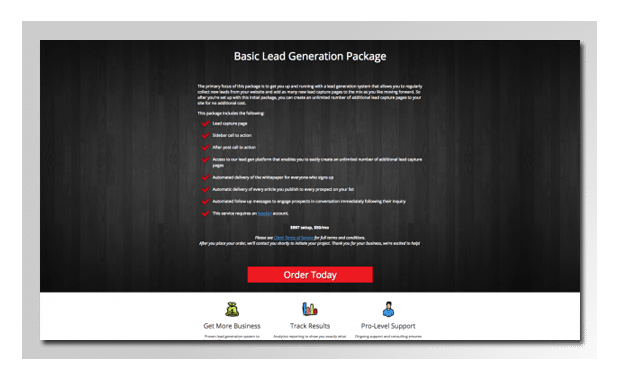 If you run a service-based business, you want to make sure you have a legit sales page for each of the services you offer. For some reason, sales pages are the norm for products, but not for services. When it comes to service providers, for some reason people tend to think they don’t need a sales page. They just have a page on their site called “services”, and they list what they sell. That worked fine in 1995. But today, your visitors are exponentially more savvy and jaded. You need to get their attention. Particularly with services, clients need to know exactly what to expect, what they’re going to get, how the process works, how much time is going to be involved. You also want to (of course), give them a compelling and easy way to pay you. Let us set up a proper sales funnel for your service, and watch your pipeline fill up like never before.